After making a delicious pumpkin bread yesterday that went very quickly, I decided it was time to start experimenting. I had some dark chocolate bars from Trader Joe's and a very ripe banana. I use the last bit of honey I had from yesterdays Pumpkin bread, but had some organic raw Agave that needed to be used. I knew this would be a different bread. Within one hour of mixing and crushing a chocolate bar, I had probably the most delicious bread, other than my apple cinnamon bread. Kids like this even better. Directions: Mix dry ingredients, except for chocolate pieces in a separate bowl. Mix wet ingredients plus the Chocolate pieces. Then combine dry and wet in a large mixer bowl and blend or stir very well. Place in a loaf tin. Bake at 350 for 45-50 minutes. This one stuck to my tin so you may want to spray non stick spay on yours. It should come out very moist and taste awesome! Let me know how it goes!! 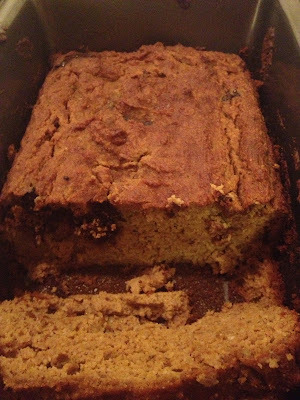 Yesterday you inspired me to make your Pumpkin Bread and it was delicious!! I will try this one next week, love that you are doing the experimenting for us :-) Thanks! Both these breads look absolutely delicious, but I have a son with a tree nut allergy. Could I substitute plain (unflavored) protein powder for the almond flour or would that alter the taste and texture too much? Maya, you could use Brown Rice flour to keep it gluten free or even a certified gluten free Oat Flour. Not sure it will be the same consistency since I have not tried that combo. I'd probably do Oat first. Let me know how that works. Made it tonight! Very good...thanks! Thanks for sharing this, it sounds delicious and I will be having a go at making this. I have been searching all over for a seasonal recipe that I don't have to feel guilty about eating, and thanks to you I have this perfect bread to whip up! 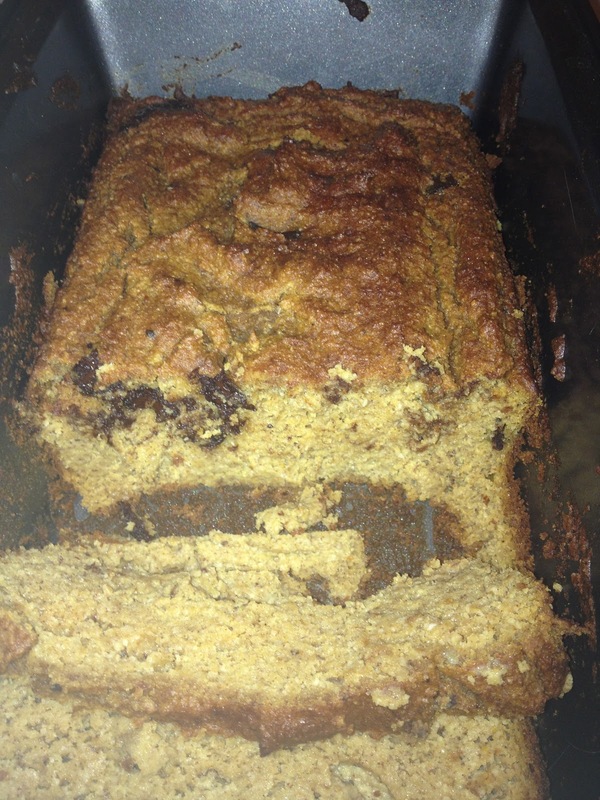 I love chocolate chip banana bread (who doesn't?) and I can appreciate a good pumpkin bread for the fall, so I am very excited to try combining the two in a gluten free and low sugar recipe. I would have never thought to mix pumpkin and banana, but I love that you did... and made it gluten free. Thanks for sharing your creativity! Nice preparation though. I am a dietician at http://www.doctorspring.com . Any way I love the recipe being low on sugars. Will surely recommend it to my patients. I just love home baked bread but have never tried Pumpkin bread. This is on my to do list!